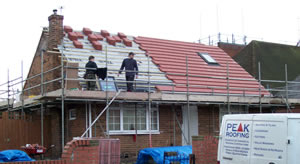 We carry out all types of roofing works with contracts for Leeds domestic roofing, York domestic roofing and Wakefield domestic roofing. 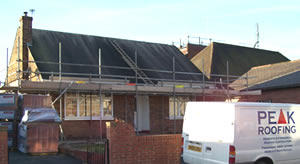 Our Yorkshire roofing work includes new roofs, re-roofs, extensions, roof repairs, leadwork, fibreglass flat roofing and insurance work - we are approved Yorkshire roofing contractors with several home insurance companies and loss adjusters for whom we carry out Leeds roofing, York roofing and Wakefield roofing. At Peak Roofing we believe in an honest and open approach to business. Our aim is to provide an unparalleled level of quality Leeds roofing services, York roofing services and Wakefield roofing services at a fair price. Whether you require a minor roof repair in Leeds, Wakefield roof repair, York roof repair or a complete new roof in Leeds, York or Wakefield property, you will receive the highest level of service. All our Leeds roofing employees, Wakefield roofing employees and York roofing employees are fully trained roof tilers and firbreglass flat roof technicians who undergo continuous health and safety training, in addition we carry �2000,000 (two million) public liability insurance.